Lilydale Lake Park playground was designed by kids - for young and old. Melbourne's newest playground the result of asking children what they want. What would a playground look like if you asked children what they wanted before you built it? 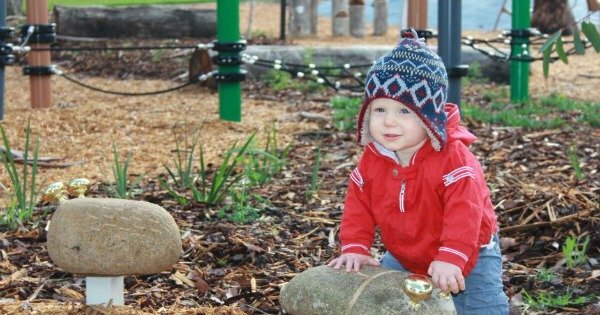 When it came time to revamp the playground at Lilydale Lake Park in Melbourne’s outer north east, the local council decided to find out. Yarra Ranges Council consulted with local primary school children, asking them what they wanted out of the redevelopment. Nature more important than plastic and colour. “It looks a little less exciting than other play spaces,” said Robyn Mansfield, council manager of built and active spaces. “One of the themes that really came through with the children was they had this very strong connection with nature, so they wanted that to be the dominant theme. Designed for young and old. It may also surprise some parents to hear that children said they wanted to share the playground. “They actually wanted a space where their parents will play with them,” Ms Mansfield said. The playground is towards intergenerational play spaces; parks that cater to all ages, including adults and teenagers. “There’s a lot of equipment in [the park] that is multifunctional, so depending on your age and your ability you can use it in very different ways,” Ms Mansfield said. It seems to be working — Ms Mansfield said the oldest known person to have used the new park’s monkey bars was 87. She said she had spent “a fair bit of time” at the park watching how people used it since it opened two weeks ago. “You see lots of older people, even if they don’t have children with them, they come into that space and they just sit there,” she said.